A suicide bomber has rammed a truck into a German consulate in Afghanistan, killing at least six civilians and wounding 120, officials said. Gunman attacked the building after the blast, in the city of Mazar-e-Sharif, battling with German and Afghan forces. The Taliban said it carried out the attack in retaliation for air strikes last week in Kunduz province. Local police said at least one suspect had been arrested in connection with the bombing. A Nato spokesman said there was "massive damage" to the consulate after the truck smashed into a perimeter wall. The blast left a large crater in the ground and overturned nearby cars. Pictures showed rows of windows blown out and buildings mangled by the force. A 5 m tall blast protection wall could barely shield the now-unusable building from the explosion, which the German military says was strong enough to shatter windows 5 kilometers away. the consul and staff fled into a panic room, while German Federal Police guards (most likely GSG9, some of them reportedly injured) as well as Afghan security forces and a German QRF battled off an attacking party armed with small arms, RPGs and suicide vests. As of now, at least five attackers have been reported killed. 'Der Spiegel' reports that Kommando Spezialkräfte (KSK) operatives were among the quick reaction force, too. May the dead civilians rest in peace. Kudos to the involved soldiers and police officers who most likely prevented an ugly massacre in the consulate. Good Job Federal Police and KSK. The embassy guards are not GSG 9, they have some special designation which is very long and bureaucratic which I forgot, but they're trained at GSG 9 facilities. I had a self defense seminar held by one of their instructors in April, cool guy. ^ You're referring to the Mission Security and Protection Service (Haussicherungs- und Objektschutzdienst) which is, however, mainly tasked with the protection of diplomatic facilities in low- to medium-level threat environments (e.g. Egypt, Jordan, Colombia). Highly threatened facilities and staff (e.g. in Afghanistan, in Syria prior to the mission's shutdown) have always been protected by GSG9. Don't know about those - but I read an article saying that besides German special forces also Belgian, Georgian and Latvian special forces helped fight back the attackers. News have emerged confirming that Germany came within a whisker of its own Benghazi last night. 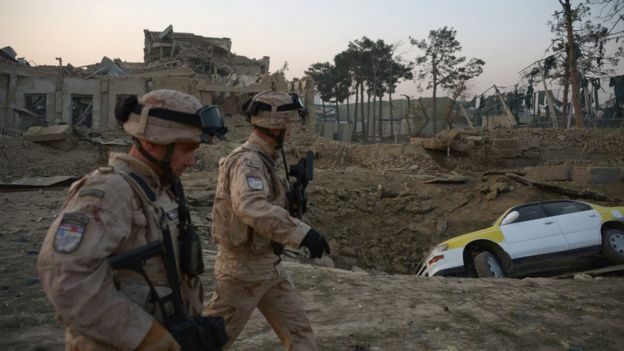 Daily 'Die Welt' reports in today's issue that Taliban fighters penetrated all security barriers in Mazar-e-Sharif and pressed forward into the consulate itself, where the impact of the explosion had turnt the doors of the protected panic room unclosable. 20 Germans and a Frenchman were fighting to keep the door shut. In another part of the building, a militant threatened consul Robert Klinke at point-blank range. Klinke was barely saved by his bodyguard, who threw the diplomat behind a desk and dealt with the attacker. Among the responding forces also were Afghans, Belgians, Georgians and Latvians. The exact bodycount remains unknown. Meanwhile the German foreign office is about to withdraw all staff members from Afghanistan. Thankfully, the good guys managed to hold the fort. RIP to the dead, and a speedy recovery to the wounded. Sad day for Afghanistan on the whole. Good job by everybody it seems, though, as commenters on Augengeradeaus have remarked, it was lucky that the attack was centered on the Consulate and there was no attempt to stop the QRF via ambush or IED. Yep. You can recognize them by distinctive pattern of Croatia on their BDU's. Or in this picture on the pants of the second soldier. RIP to all of the dead. GJ to all of the security personnel. Well, there are already allegations the German QRF would've responded too late. Does anyone have a map over the area? I can't find where the hell the consulate is located. ^ The distance between the consulate and Camp Marmal is about 18 kilometers if that helps. Correction: NATO's QRF in Camp Marmal isn't mounted by Germans but Georgians. The Germans have their own force protection response group though. A Georgian platoon and a German squad, apparently supported by a multi-national special forces element from Belgium, Latvia and Germany, arrived at the consulate about 30 minutes into the attack. More backup arrived after another ca. 45 minutes, so we needn't heed the nitpicking by German journalists who indeed crave for another Benghazi. By and large confirmed by a newsflash on the German military's own website, broadcaster 'Deutschlandradio' reports another strange incident to have happened shortly after hostilities ceased: An Afghan motorist approached a roadblock, stopped as bidden and left his vehicle to have a chat with the troops manning the checkpoint. A few minutes later he appeared to drive away — only to turn his vehicle for a second time and approach the roadblock with high speed. The distance was so minimal he couldn't be stopped in time. Consequently, he crashed into the roadblock and into the back of a German armored personnel carrier. Stuck there he was fatally shot as a potential suicide bomber; IED specialists found no such device on his body or in his car though. He was pronounced dead in an Afghan hospital. A case of a local snapping? Them foreigners ain't gonna tell me what to do? An attempt to kill a few infidels? No surprise they killed those motorcyclists later that night, it's actually very commendable the involved troops tried to warn speeding motorists again with signals and warning shots in spite of what had happened earlier. Without warranty for potential double counts, the end toll seems to be: 9 Afghan civilians killed, 121 wounded; 5 attackers killed, one in custody; two Germans as well as two Georgians wounded in action. It's a miracle that no civilians inside the consulate received any wounds. Another victim is Germany's political freedom of action: even without killing anybody, the Taliban bombed our diplomats out of the country. Thanks but not really, that's the rough driving distance from Marmal to the center of the city. I was more interested in an actual position. If the QRF got there in 30 minutes they made good speed.